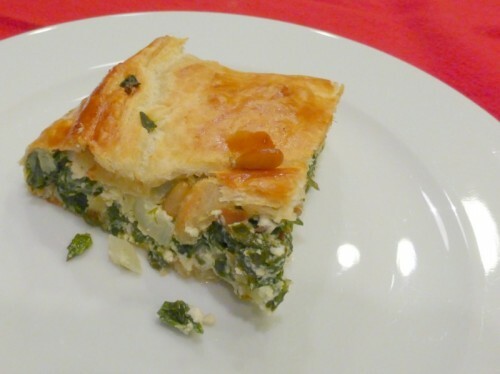 This recipe idea is “borrowed” from “River Cottage VEG” and Hugh Fearnley-Whittington”s recipe for “Corner Shop Spanakopita.” A Greek spinach pie was reconfigured to be made with ingredients easily available from his local convenience store. My version incorporates ingredients available from my weekly CSA share and using grocery store puff pastry instead of the delicate layers usually found when using Greek filo and lots of butter. 2 pounds of greens (turnip, kale, chard, collard, spinach) rinsed, stemmed, chopped, and wilted in boiling water for 2 minutes. Stem and chop greens. Blanch in salted boiling water for 2 minutes. Drain off all water and wrap greens in towel to squeeze out excess moisture. Heat olive oil in frying pan over medium heat. Add spice seeds and let them cook for a minute. Add onion and sauté 5-10 minutes until soft and pale gold. Add herbs. Chop greens and add to onion along with lemon juice, salt and pepper. In a large bowl beat eggs reserving a tablespoon to glaze the pastry. Stir in the greens and onions. Add cheese. Your filling is almost ready. In an 8 x 10 oven proof dish lay the puff pastry sheet that has been rolled out. The edges of the pastry should exceed the sides of the dish. Place filling on pastry and top with nuts. Fold pastry over the filling and seal ends. Brush with egg.